Border Crossings: Professor Karen Bakker tackles transboundary issues with flair. Karen Bakker’s voice is strong and clear as she explains how, as an undergraduate student at McMaster University, she learned that people in Hamilton had no access to the lake at that time. This is how she became fascinated with the relationship between water and community. Bakker has worked on five different continents, was named a Rhodes Scholar in 1995, and currently holds the position of Canada Research Chair in Political Ecology. 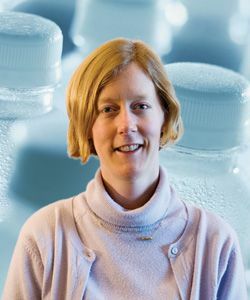 She is also a full professor in the geography department at the University of British Columbia, where she is the founding and current director of its Program on Water Governance. From 2008 to present, the program has held a Canadian Water Network grant for its team of eight researchers and 20 project partners across Canada to conduct research that informs and inspires community and government in their decision and policy making. Setting out to challenge the widespread notion that water is infinitely available, Bakker says that Canada contains just 6.7 per cent of the world’s fresh water. Most Canadians mistakenly believe this number to be far greater. “It’s kind of my mission to make everyone aware of this figure,” she says. This year, Bakker was named in Caldwell Canada’s Top 40 Under 40, which she is especially pleased about—“it means that the water situation is on the public radar,” she says. Also on the public radar is her 2006 book Eau Canada, a compilation of writing from the country’s top water experts. The book brings to light issues that most people may not already be aware of, and continues to be a best seller for UBC Press; the Gordon Foundation has even purchased a copy for every Member of Parliament. “When I initially pitched the concept, I was surprised to learn that there aren’t many books out there that balance facts and informed dialogue,” Bakker says of Eau Canada. Her article for Policy Options entitled Water Security: Canada’s Challenge (July 2009) follows in the same vein of public outreach, making dialogue on transboundary water issues accessible to the general population.